High-school athletes are using more smokeless tobacco, even though overall tobacco use among high-school students has declined, according to a study published by the federal Centers for Disease Control and Prevention. Student responses to the national Youth Risk Behavior Survey from 2001 through 2013 show that the share reporting any tobacco use dropped to 22.4 percent from 33.9 percent, and the rate of those smoking combustible tobacco products dropped to 19.5 percent from 31.5 percent. However, those who reported using smokeless tobacco products increased to 8.8 percent from 8.2 percent. The increased use of smokeless tobacco was driven by athletes. The rate among non-athletes remained unchanged at 5.9 percent but has “increased significantly” to 11.1 percent from 10 percent in youth athletes. 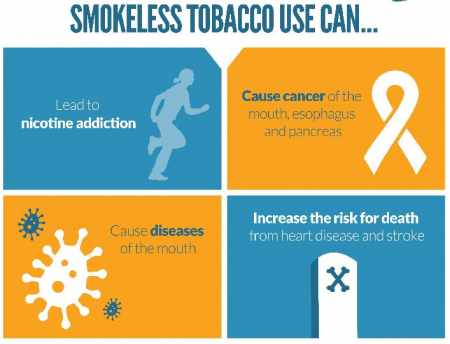 The 2013 YRBS found that 26.3 percent of Kentucky’s high school youth reported any use of tobacco; 17.9 percent were smoking cigarettes, and 13.2 percent reported using smokeless tobacco. As of September, Kentucky had 47 school districts with comprehensive tobacco free policies. 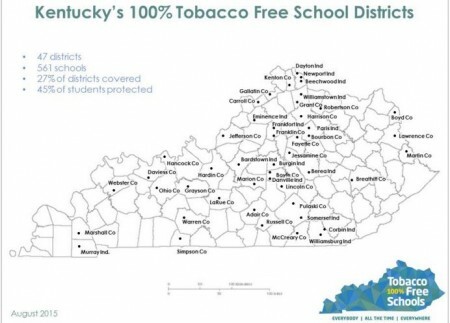 These policies cover 45 percent of Kentucky’s students and represents 27 percent of the school districts in the state, according to the Kentucky 100% Tobacco Free Schools website.